reruns of WKRP In Cincinnati. WKRP in Cincinnati was a CBS sitcom featuring an ensemble cast of characters working at a Top 40 radio station in Cincinnati, Ohio. About 88 episodes aired between 1978-1982 and although I was just a little kid during the show's heyday, I remember loving the theme song and the silly story lines. Who could resist the hilarious antics of Dr. Johnny Fever (Howard Hesseman) or Jennifer's (Loni Anderson) beauty or the soulful charm of Venus Flytrap (Tim Reid)? 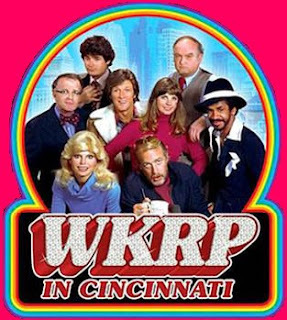 Remember WKRP in Cincinnati? Here's an episode for ya. Funny someone else just posted about this show. I was actually friends with Loni Anderson's daughter in college. She was very sweet and close with her mom. I used to love the show too. I love WKRP! I have the first season on DVD and I hope the next season comes out soon. Since this is Thanksgiving week, everyone should watch Turkeys Away, haha! I liked the original version of WKRP and even in reruns I would always try to figure out where the knob would finally stop on the AM dial. I did not like the updated version that they tried to pawn off on the general public back in the early 90's. Just seeing the title of your post put the theme song in my head - and I haven't seen one of those re-runs for more than 20 years! I remember having to sit through this show as a kid while my parents chuckled away! Makes me feel so old seeing this show. That was a great show. I think it was on Monday nights, before or after MASH. I'm following you now, and I hope you'll follow me too. You have a great blog with the perfect title. What a great show. I remember just being a fan of the show practically made you cool! Heck, my friends and I STILL make references to episodes etc. at work to this day! Do you remember when they tried to bring the show back in the 90's? Also.. My buddy met "Less Nessman" in Boston during the shows heyday. He said everyone was shouting stuff like Hey.. Less Nessman! I guess he was really eating up all of the attention! I loved that show! It was one of the first ones, where I wanted to see every episode. Electric Company - Hey You Guys! 80s Christmas Commercials | Folger's "Peter!" Remember Deb Shops at the Mall?